A post all about me... Jenny James aka Art by Jenny. Its been a while since I wrote in my blog, since Easter in fact, but with time flying past so fast and so many things I want to get done each and every day, I kept putting off the blog (I've a folder on the desktop with loads of examples and notes) until I had more time. But time is something I need to learn to manage, not wait until it stretches into more time or go slower. To start off my blogging momentum (again), I thought I'd start with who I am and what I do. While chatting with friends I've found that what I do confuses people, so here it is, clear as mud!!! Its that fairy illustration again! I know, I keep posting her everywhere, but she's gorgeous! I'm so happy with how she turned out. This fairy was digitally hand painted using Adobe Photoshop. I love how her wings turned out... and the butterflies, hair and flying teddy! Visit www.redbubble.com/people/georgiegirl to see the whole painting. 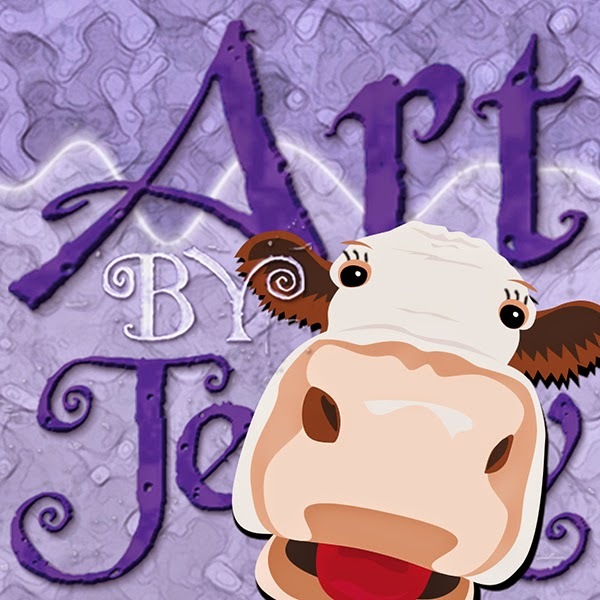 'Art by Jenny' is here for all your graphic design, publishing and illustration solutions ... local and worldwide! My website and portfolio - www.artbyjenny.com.au - designed and developed by me! I'm happy with it and hope you like it too. On my todo list is to redesign it to be more mobile friendly and not so green... if you have any ideas on what you'd like to see stay or go, feel free to give feedback. As an accomplished artist, I also love to share art and craft techniques with everyone and anyone... so an afternoon every Saturday has been dedicated to 'Something on Saturday', whether its Me, Myself and I or a group of friends... its a day of art. Book today so you don't miss out!!! Something on Saturday is an Art Workshop held in the Art by Jenny Studio at Christie Downs. Every Saturday at 1pm. My workshops are fun, relaxing and inspiring... with no more than 6 in a class. Hello! This is me, Jenny. 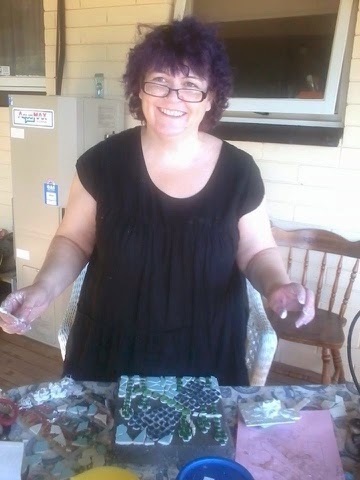 Here I am at a mosaic workshop taught by my bestie Donna. We had such a fantastic day breaking tiles, making a mess and creating a beautiful stepping stone. For only $60 you discover new skills and have fun in a relaxed, welcoming atmosphere (max 6). Don't bring a thing (unless you have fave tools you want to bring) - just come along and have fun! REDBUBBLE ... Check out my online art gallery and shop - www.redbubble.com/people/georgiegirl. My artwork is sold worldwide! There is a wide variety of artwork and photography at Redbubble... so many clever and talented people all in one place. Redbubble organises the fabulous, high quality products for us so we don't need to worry about anything except creating art or taking photos. There are many amazing writers (authors and poets) floating about RB too, so check them out. There's something for everyone! MY ONLINE SHOP ... hosted by Shopify (they do a great job with the SSL, encryption data and other high tech stuff that creates the little padlocks and keeps all our private data safe). I've also got an Etsy shop... it echoes abit at the moment from lack of goods but stay tuned for its virtual shelves to have amazing handcrafted artworks and wooden creations. At the moment, there is a boutique sized collection of art supplies and craft products... including Darkroom Door stamps, Distress Inks, Graphic 45 papers (some) and a collection of Readymade (Pre Designed) Logos. Soon to be added are quality artist paints, brushes and supplies by Liquitex, Windsor and Newton, Reeves and Jasart and lots of other awesome arty goodness. Plus more products from Tim Holtz, Ranger, Dina Wakely, Dylusions' new colours and so much more. I've got so many ideas and things make (and then add to the shop) - original artwork, handcrafted rubber stamps, stencils and more artwork plus Wood'n Marbles has delivered a huge stash of his gorgeous wooden creations... fairy steps, nursery rhyme plaques and an amazing sailing ship. FACEBOOK ... www.facebook.com/ArtbyJenny.GGofRB. Feel free to 'like' my page and share with your friends (thank you!). PINTEREST ... pinterest.com/georgiegirlofrb/ a place to share and find inspiration for life, art and everything inbetween. So I don't do much really, do I? Could be why I seem to keep running out of time each day! lol But I live in the slow lane and eventually I want to do will get done... and my dream art shop and gallery by the seaside is getting closer every day.